Core domestic retail sales are up a whopping 5%, year over year, continuing a very strong upward trend. These sorts of readings are unmistakable positives for the United States’ economy, and in no way speak to a weaker outlook. This raises an obvious question. Why are markets behaving as they have the past few weeks? Throughout the past couple of months, markets have not been singing a happy tune. The Dow has lost over 1,000 points and corporate credit spreads have jumped to levels not seen since early 2016. Measures of risk aversion have spiked (CBOE VIX and the St. Louis Financial Stress Index). Safer and more stable companies (“risk off” stocks) have been outperforming riskier and more volatile ones (“risk on” stocks). Markets seem to be questioning whether the good times will continue, despite continued news about the U.S. economy. But if we take a step back, we growing global risk-aversion — suggesting that issues are emanating from elsewhere. Most of the world’s stock markets are in the red this year, as output and growth forecasts are cut. 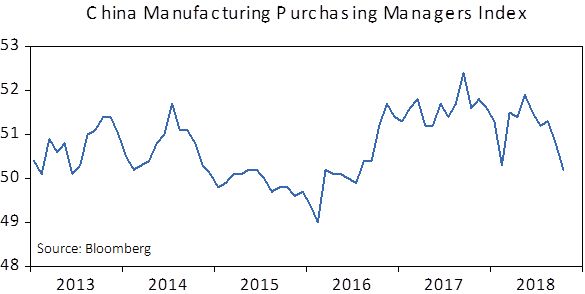 As the chart below shows, Chinese Manufacturing, often seen as the “canary in the coal mine” for global output, is rolling over (Chart A, Below) and global prices for industrial metals are also off sharply (Chart B, below). Not surprisingly, the International Monetary Fund also recently trimmed its global growth forecast to 3.7% from 3.9% for both 2018 and 2019. All-in-all, we view the last month’s jump in market volatility as out of step with the hard data we are getting on the U.S. economy. Most of that data, sometimes referred to as “fundamentals”, is more positive than just about any time since the cycle began. The strong economy has led to tightening capacity in some areas, a firming of inflation, and prompted the Federal Reserve to begin to remove the “punchbowl” by raising interest rates. A key question is whether the recent “risk-off” mindset of traders spreads beyond financial markets into the “real” economy. As evidenced by recent data on the economy’s performance, we can say that worsened market sentiment has not hurt the “real” economy yet. A sustained and further widening of credit spreads, a further sustained fall in commodity prices, or a sustained pickup in equity market volatility could begin to impact business’ investment and consumer’s spending plans. We think the U.S. economy will grow faster than our 2.75% long-run growth forecast. Portfolio risk levels have already been reduced from above average to about average, beginning last spring due to a fall in our WCA Barometer. For core equity positioning, we are sticking with tactical calls to remain overweight domestic versus foreign; developed versus emerging; and value over growth. For more on our WCA Fundamental Conditions Barometer and long-term capital market assumptions, please click here.